Since 1962, R X Hearing Aid Service has proudly provided hearing tests and hearing aid services in Lancaster and the surrounding areas. We are an independently-owned and operated business with over 50 years of experience, offering a battery of hearing tests and a full range of hearing aid equipment. Visit us today to learn more! Living with hearing loss means getting accustomed to life with a hearing aid. This means investing in the right model, having it properly fitted and maintaining it for as long as you own it. 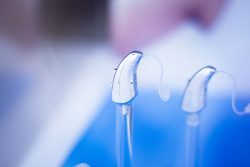 R X Hearing Aid Service is ready to help you make sure your hearing aid is perfect for you, from the moment you pick it out to any successive services it might need. Our store has a full range of hearing aids in Lancaster, PA, designed to provide you with the ideal fit and function for your unique type and level of hearing loss. Moreover, we’re your premier destination for batteries, cleanings and more. In addition to retailing a broad range of trusted, name-brand hearing aids, we’re also an ear specialist in Lancaster, PA. This means we can perform audiology testing on you, to help determine if you’re suffering from hearing loss and the nature of that loss. From sensorineural hearing problems to tinnitus, we can diagnose your condition and provide you with the products and advice you need to live your life to the fullest. Whether you’re in your 20’s or approaching your 80’s, we urge you to visit us today to have your hearing checked—because you’re never too old or too young to address hearing loss. We offer free hearing testing, free batteries for life and a zero charge for checkups! Senior citizens receive a 10% discount on all our services. We’re pleased to be a registered hearing aid dealer with the Pennsylvania Department of Health. We have more than 50 years of experience with hearing aids and offer any brand or type that might be ideal for you. Hearing loss can occur at any stage in life, without your noticing. Schedule a hearing test today to make sure you’re catching hearing problems before they get worse.